Growing up, we always had a big, live Christmas tree. In fact, for a good part of my childhood we had more than one tree. There would be some sort of formal themed tree. It might have white lights and all gold ornaments or something like that...something very tasteful. And then there would be the family tree with the colored lights, tacky tinsel and all the mis-matching ornaments, each of which carried some sort of story. One of my sisters is so into trees that she does five every year. So I guess it's a thing in our family. I only do one tree. And for the past four or five years, I didn't do any trees at all, primarily because it's hard for one person to set up a 6'-7' live tree all by themselves. And since I felt like crap most of those years, the tree never got done. It has now been almost a month since I started feeling better, so I put up a tree. I decided to be nice to myself and just get a cheap artificial tree that doesn't shed needles or need water or anything. As a result, for the first time ever, I had a tree set up in the first week of December. I have a lot of ornaments. More than you can tastefully fit on a big, fat, live tree and way more than you can tastefully fit on a $30 pre-lit artificial tree from Target. My ornaments are more or less organized across a handful of boxes. There are three boxes with ornaments deemed "desirable" and a box or two of ornaments that are on the B Team. In the B Team box you might find ornaments I once thought were nice, but now think are ugly. There might be a couple that are a little broken. And there are a few I don't even much like to look at. But I don't throw any of them away. They are pieces of my autobiography. One of the best parts of having a tree, in my opinion, is putting the ornaments on. Because each has a story. My mother used to sit there as her six little slaves would unpack ornaments for the family tree and show them to her, one-by-one, so she could point to where we were supposed to put it on the tree...haha. And she would provide commentary like, "oh, that's the one you made me in second grade. Put it over there." Or "that was the one Winnie sent us." Each ornament held a piece of our family autobiography and its position on the tree indicated just how big a piece it held. There have been years that I've purposely put ornaments on my tree that have sad memories attached to them. Maybe they were from friends and the friendship ended badly or something. But I would put them up because they were part of my autobiography—from a time and experience long passed, but still part of my makeup. Every year is a different combination of memories based on my whims when setting up the tree. And, of course, new ornaments enter the rotation yearly. But, like I said, the decoration had kind of stalled for a few years. And I could see how much I had changed because I decided not to torture myself with any ornaments that held bad memories. Many of those ornaments are very pretty and were once favorites. They have sentimental value, but nonetheless make me think negative thoughts. Because of the circumstances around my father's death, very little as far as old family ornaments still exist. One small tin of my father's childhood ornaments are all that are left and one of my brothers has those. I had them for safe keeping many years back and was too afraid to ever hang them because they're glass and, with dogs in the house, you have to be careful how you hang your ornaments. So my personal "tree autobiography" starts with my adulthood. Every year I hang at least one of the ornaments from my first adult tree. They are all crappy little ornaments—crappy because I couldn't afford to buy nice ones and little because, back then, I always got a tabletop sized tree. Those ornaments remind me how far I've come, but they also remind that having more money now isn't making me happier. Then there are some that were gifts or remind me of others. So my sisters and a few old friends are represented on my tree and I think of them when I hang "their" ornaments. Then there's this one ornament I thought was so beautiful that I went to four different department store locations to track it down. That one reminds me of when I had the energy to actually go to malls during the Christmas season. When you think about it, our "family" trees are a deeply personal item. And if you're like me, you probably see the tree in someone's home and just register the basics—the size of the tree, live or fake, the overall look of the decorations, the overall impression/style/taste—then you move on. We don't tend to stand at another person's tree and wonder about the stories behind any of the ornaments. Maybe if it's a really unique one, but not usually. And it's likely the stories are a snooze-fest for anyone but family anyway. And yet, when you stand before someone else's tree, you're nonetheless standing before these intimate artifacts from their lives...things with the power to evoke things long forgotten. "This was from our first Christmas together" and "I got that the year I moved here from Denver" may be what you say to someone who inquires, but what it evokes within you when you say it is often a story kept to yourself. So many clues to your life hang on those branches, right out in the open for everyone to see. 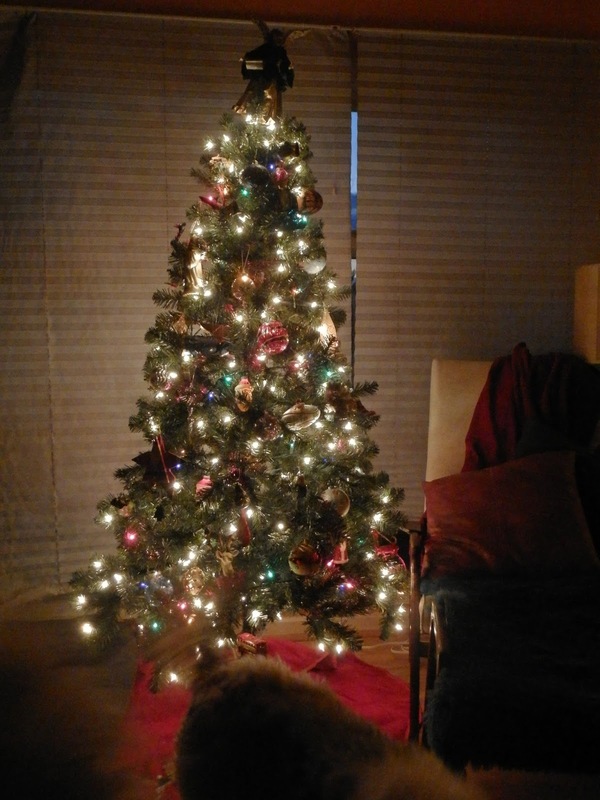 Anyway, it had been years since I'd taken that stroll through my life and I'm so glad I put up a tree this year. I also bought a number of new ornaments that will one day evoke memories of this year and this stage of my life. This year's tree was a symbol of new hope for me and when I pull out the vintage ceramic bird light covers I found on eBay or the carved red cardinal, I'll remember this feeling. What does your tree this year say about you?